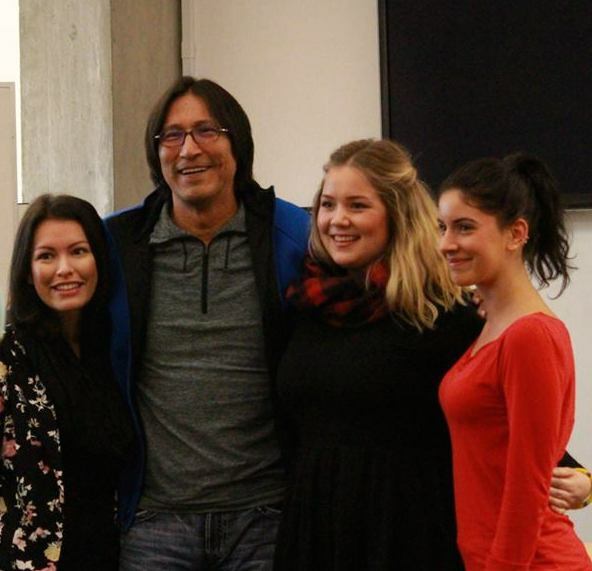 The First Nation Studies Students Association along with the UBC Graduate School of Journalism had the pleasure of meeting with celebrated Ojibway journalist and writer, Richard Wagemese. Richard spoke to us about storytelling and his journey as a journalist. His accounts were both profound and insightful with just the right amount of humour; the marks of a truly gifted orator and storyteller. Thank you to Richard for taking the time to speak with us and to UBC Journalism for hosting the event. Richard was in Vancouver to speak at the Vancouver Writer’s Fest with Thomas King and Lee Maracle. Hey there, Matthew Ward here, incoming President of FNSSA and also UBC’s unofficial resident pizza-lover. I am from Driftpile Cree Nation in Northern Alberta and am going into my…5th (ugh) year here at UBC and have been involved with the First Nations Studies Program (yay!) for 2 years. During this time, I’ve done a lot of learning, and with that, a lot of growing. I’ve had to take seriously questions surrounding my identity; my Cree father and white mother, and the critical identity politics that surround being a full-status, yet mixed-identity Indigenous person. I’ve had to confront my queer identity, as a gay man, and how that positions me within my school, Vancouver, my family, my community (Driftpile Cree Nation), my hometown (Slave Lake, Alberta), my relationships, my language, and my culture. It seems hard to believe that I’ve only been involved with FNSSA for a year and a half, and in that time have been able to contribute to the community through supporting the fantastic projects that have come to life through this student group; from the journal (coming soon!) to the blog (where you’re reading this!). From our fantastic member-appreciation events (Double DD Pizza anyone?) to the successful fundraisers (like the $1200 raised this past Spring!). None of this would have been possible without the support of our team, and the community we have built. Our support for one another is matched only by our accountability to each other. With FNSSA, I’ve been given the opportunity to explore my identity and ask difficult questions around people that, not only genuinely care, but are experiencing these life changing (and often crisis-inducing) questions too! As a club, we operate so closely in our personal lives, our academic lives, and our extracurricular activities that we get comfortable sitting together, walking together, spending every waking moment together (kidding, but only a little). I’m here to tell you that you’ve got absolutely nothing to worry about if you are wanting to get involved with our tight group! FNSSA is an inclusive community that values all of its members, new and old, and the wonderful contributions they make! What made becoming a part of FNSSA so easy is that I didn’t need to know everything about myself or the world, I didn’t need to be able to explain how I live decolonization through my life, and I definitely didn’t need to be Indigenous (though I am). What mattered to this group of people was that I supported the work we felt was right, ensured everything we did was rooted in giving back to the community, and to make sure we held each other accountable to our actions. It is through these values that I’ve lived the last 3 years of my life at UBC, and it is these values that I give credit to for the many successes our student club and its fantastic members have achieved. This club has supported me at my highs and lows, and has been a contributing factor in my decision to continue my studies in academia. As one of many leaders in FNSSA, I want to ensure that this space, this club, continues to offer that to FNSP students, UBC students, Indigenous peoples, and non-Indigenous peoples. All it took was for me to show up at a meeting where I didn’t know a single person (which happened to be the first meeting for the journal) and 1.5 years later, here I am among many others, working to better our communities, challenging each other, growing, and having fun along the way. It is my hope that through this post, you will see just how amazing FNSSA has been; a highlight of my experience here at the University of British Columbia, and I want you all to be a part of it. FNSSA is always looking for fun, passionate, and excited people to take on a multitude of projects. Among those already stated, we’ve presented at conferences (F-Word, Student Leadership Conference), we’ve facilitated workshops, and we manage online content through our blog and a social media presence on Facebook. We’ve engaged multiple levels of community organizations, faculties, and student groups in dialogue around Indigenous issues on and off campus. We’ve got a number of upcoming projects in the works too AND we host really fun parties so we can get our groove on! All this and more could be yours, and I sincerely hope you get to experience what I’ve had the opportunity to experience being a part of this fantastic student club. If you’re interested in getting involved, like us on Facebook to find out when our meetings are, send an email to fnssa.ubc@gmail.com. As an alternative, you can contact me personally at mattward.ubc@gmail.com. I look forward to (hopefully) getting a chance to know you! Every time I enter the Museum of Anthropology (MOA), I feel hopeful that this time it will be different. I feel good, at first, in the minimalist space, enveloped by concrete, natural light, and high ceilings. Tucked between cedars, on the edge of a cliff that overlooks the windy Pacific, MOA is located on a powerful, spiritual piece of land. But it doesn’t take long before the bitterness and resentment start to wash over me. I see and hear that MOA is trying. Artworks by Musqueam artists stand at the entrance, evidence that a more positive relationship is being forged between the institution and the Indigenous peoples on whose traditional, ancestral, and unceded territory the institution stands. But as soon as I enter through the doors, and I feel the spirits of the totems standing there, so far from home, I start to feel sick. Uprooted. That is the word that came to me on my first visit, and it is the word that still haunts me. I come upon my partner’s family house post, and I speak to my great-grandfather-in-law. Meegwich moshum. Thank-you for standing here. You are loved. You are missed. You are remembered. By the time I enter the multiversity gallery I can’t keep the disdain off my face. I remind myself that MOA is doing some great work to create space for relationship building. Native youth give tours. Some of the display cases are curated in partnership with First Nations. But the walls and the drawers are so crammed full of items, I wonder how the spirits have room to breathe. To move. To dance. There are so many masks, drums, carvings, baskets, and tools it is as if I have entered an ethnographic hoarding situation. Why are these here? How did they get here? Who do these belong to? I am not the first person to ask these questions. They are questions folks who tour the museum, who write about the museum, and who work at the museum constantly ask. Moving on, the tour starts to get more personal. I come upon the small section devoted to the Plains. My people. A relative’s moccasins. A relative’s headdress. A relative’s basket. I look closely at the glass display cases. If I am entirely honest, my agitation is coupled with a bit of desperation. I am looking for medicines, looking for signs of my relatives. It is part of my search to recover my own Nahkawe-Nehiyaw identity, something that was also seized temporarily by colonization. I am looking for something that might help quell the ancestral grief that lives in my bones, if just for today. I put my hand on the cool copper handle of the drawer beneath the glass case. I have heard these drawers are special. Imported from Europe. Very expensive, you know. The drawer slides open gracefully. I almost cry out when I see what is inside. Sacred pipes. I am told that Pipes were given to the world to help to heal the people. Pipes are meant to smoked, to carry our prayers to Gihzwe Manido. Pipes are meant to be in ceremony. Pipes are meant to be lovingly carried in beaded buckskin, and feasted. And here they are, sitting in a bourgeois anthropological museum, objects of curiosity. It has been over a month since I saw the pipes at the MOA, and I am still thinking about them. I see how much healing my Indigenous communities, friends, and family need, and I know those pipes can help to do that work. It is hard for me to know that they are in there, unable to carry out their original instructions. I could hear the pipes singing songs of sadness, loneliness…their spirits are hungry for love. Following my encounter with the pipes at MOA, I felt inspired to respond. 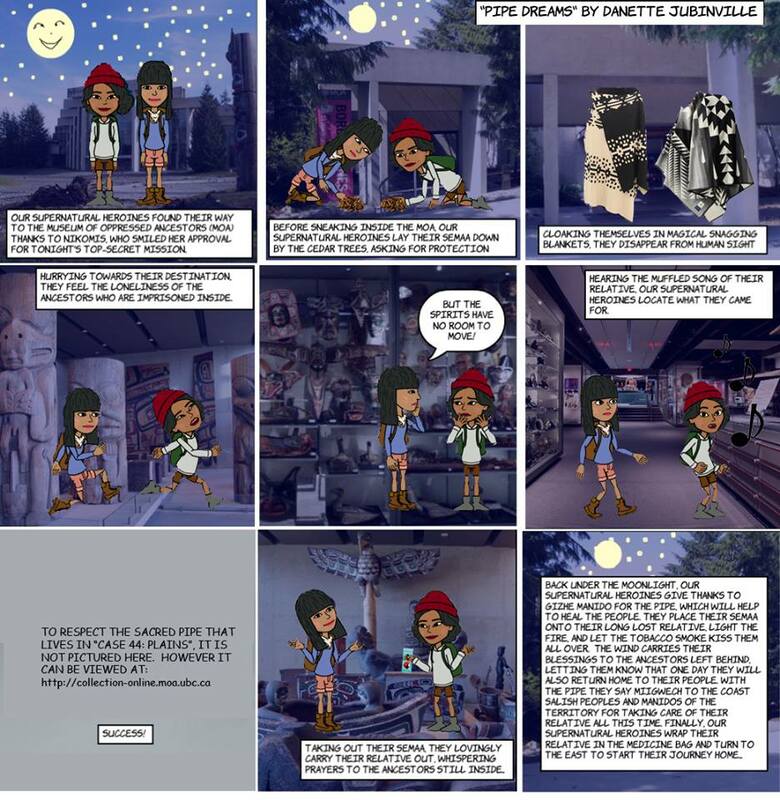 I drew a comic strip, titled “pipe dreams”, which allowed me to explore new possibilities through imagination and fantasy. While pipe dreams is clearly a critique of museums, and MOA in particular, it is not meant to discount the good work that is being done in those institutions. The Museum of Anthropology is a world leader for its progressive policy reform and extensive efforts to work collaboratively with Indigenous peoples, thanks to Indigenous activism and visionary work done by museum staff. Community outcry to past displays of sacred ceremonial objects has resulted in teachable moments for both the institutions and the public. Today, an empty display case in the Multiversity Gallery makes a statement that educates visitors on respect for cultural protocol. Evidence of the institution’s humility, many exhibits at MOA provoke interrogation of museum practices. And perhaps the most encouraging aspect of MOA is that it has demonstrated a commitment to working with the Indigenous community. In these ways, MOA has shown that museums can simultaneously be sites of colonization and decolonization. And yet, I cannot ignore the way I felt in my body and spirit during my last visit. Sometimes I wonder, why do museums have to exist, as a given? I see the value in galleries displaying objects, art, and artifact with permission of those who made them (or their descendants). But for those items that were stolen or otherwise dishonourably acquired, for the items that are shown with question marks on their identification cards…do those items have to be kept? It cannot be ignored that MOA is a multi-million dollar facility that draws in tourists. What message is being sent to those who do not have the tools to think so critically, or those who are not so familiar with the nuanced histories and context of MOA and its collection? While those questions are important, the questions that are really on my mind, and that I mean to pose with pipe dreams, are this: What are our responsibilities, as Indigenous peoples, to objects that were given to use to care for by our ancestors, but are now locked behind glass? And, knowing that they may or may not eventually return to our communities, how can we feed their spirits? This past Sunday, I attended the Elders Craft Fair at the Vancouver Aboriginal Friendship Centre. My shopping list included smoked salmon, beaded earrings, and hopefully (fingers crossed!) some bannock. The gymnasium was full of tables with Kookum’s and Mushum’s selling their wares; deer hide roses, cedar weaved baskets and jewelry, stunning beaded creations, carvings and gorgeous Cowichan sweaters, bags and hats (take that Aritzia). My shopping list was successfully fulfilled by the end of the morning, however the most memorable part of my Elders Craft Fair experience was a small sign at a table that read “Will Trade”. I immediately thought of the system of trade that had been unintentionally set up between a small community of Indigenous students on UBC campus. Last year, I was gifted a large amount of moose meat. Upon preparing it in a slow-cooker for eight hours, I gifted the majority of it to friends that I knew would appreciate its origins as a Moose that had been tracked by hunters who understood the importance of respectively hunting and harvesting an animal. The following weeks, I was gifted Elk sausage, more Moose meat, Deer, and Salmon. This system of trade has persisted and I am reminded of the resurgence of the Potlatch System, where our economies were supported by giving and not consuming. I could have easily consumed that Moose all to myself, but my sending it out into a community of loved ones, I was gifted a diverse and rich amount of meat and friendship. The Elders sign signified an intelligible and community oriented way of accumulating wealth: through building relations and giving for the purpose of trade. I cannot imagine a more powerful form of community oriented and anti-capitalist, grassroots resurgence. Tonight I attended a lecture on “Decolonizing the Language Revitalization Process” given by April Charlo (Bitterroot Salish people) and Khelsilem Rivers (Sḵwx̱wú7mesh-Kwakwa̱ka̱’wakw). There were two points that I found particularly earthshattering. One was that there is no word for sorry in Salish. Apology, regret, and a hope to make it better are not something that you can express in a single word. The concept is much bigger than a single word in the Salish dialect that April speaks and it is something that you have to express in your actions, words, thought and in the impact that it has on another person. What came to mind for me was how Beverley Jacobs responded to the Prime Minister’s apology “What is it this government is going to do in the future to help our people?” How valuable is a word like sorry without all those other expressions behind it? What would an apology from Stephen Harper on behalf of the Government of Canada look like, feel like, sound like if there was no word for sorry? 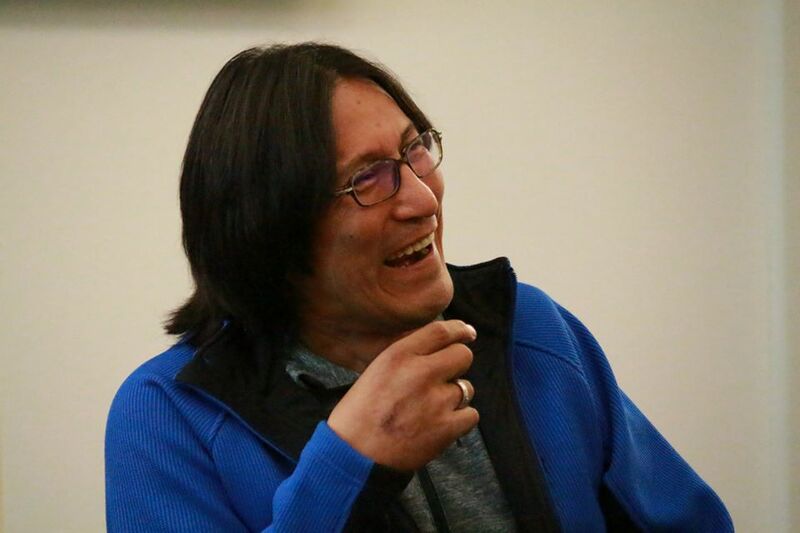 It is easy for me to tell Stephen Harper he should embody what he talks about, but Klhesilem River said something that made it harder for me to just do that. He was talking about the difference between linguistics and revitalization, where one is the study of a language, which is not focused on creating a healthy community of fluent speakers. Linguistics is learning about a language, not learning a language itself, and yet our language classes are often focused on learning the suffixes and the pronouns and the verbs and all the other parts of the language, or on the translation of words in one language into another, and not on the actual practice of speaking the language. I was feeling really great after the lecture, like I had learnt a lot. And then on processing a bit, it hit me then that in studying decolonization or reconciliation as I am often in First Nations Studies, I am not (necessarily) practicing decolonization, maybe at all. This is a challenging thing for me to face, because FNSP feels lovely and safe, and I feel pretty confident in my ability to discuss decolonization and reconciliation. How can I begin? By Katherine Carey, a fifth year First Nations Studies student who grew up on the unceded territory of the Bantu people and the Coast Salish people. She has worked for various women’s centres in Vancouver, and is currently completing a practicum for the First Nations Health Authority. This reflective piece was written after she had attended the event on September 25th, 2013 at SFU Goldcorp Centre for the Arts.